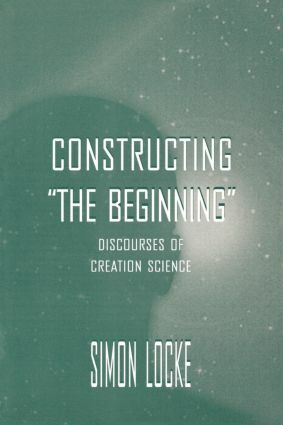 In Constructing the Beginning, Simon Locke offers a new approach to considering the enigma of creation science, using the perspective of discourse analysis. Using the publications of the British Creation Science Movement to perform a detailed analysis of the creationist case, Locke demonstrates that the discourses and rhetorics used by natural and social scientists are also employed by non-scientists. Out of this study, a view of science as a cultural resource develops, questioning the adequacy of perceived sociological wisdom that sees science as the source and emmbodiment of cultural "rationalization." As a case study of the use of science as a discursive resource in everyday life, Constructing the Beginning speaks to scholars of discourse analysis, constructionism, rhetorics, and the public understanding of science. It will also be of great interest to scholars in the areas of cultural studies, sociology of scientific knowledge and of religion, postmodernism, and sociological theory. Creation science is the target of much attack these days from both within and outside of the orthodox scientific community. This book, however, takes a different approach. It is not an attack on creationism; nor is it a defense. The author's interest is not in creationism at all, but rather, it is in the questions of the role and significance of science in modernity or the public understanding of science. Locke's approach to this issue is a discursive and rhetorical one. Creationism is treated as a case study of the argumentative engagement between science and non-science which--in his view--is as central to the commonsense lifeworld of modernity as much as it is to the lives of its intellectuals. An important dimension of the public meaning of science in modernity is its limits and its relations with other modes of thought and belief, which continue to survive as discourses in the wider culture. Creationism is merely one example of this general feature. *the realization that both of these problems must be managed together in such a way that creationists' own version(s) of the world and of the Word are compatible--a compatibility achieved through a discursive syncretism. The final chapter brings together the strands of the argument to further develop the implications of the dilemma of science for the public understanding of science through the idea of science as a cultural resource and its possible relation to other such cultural resources within modernity--such as Christianity. It is suggested that much so-called "anti-science" could be made sense of in these terms and proposes further research in this direction. "This groundbreaking study was originally part of a PhD thesis in communication at a British university….The end result is a rich interplay of ideas and analysis that is helpful in understanding the rhetorical complexities in conversations about origins, the limits of scientific knowledge, and the limitations inherent in 'scientific' discourse." "Simon Locke's book pleases me very much, not because the author has mastered the particulars of creationist literature (which he has), but because he uses creationism as a case study to explore something far more important than the particulars of creationist thought--namely, relations between modernity and science." Contents: Preface. Let There Be Rationalization. Creating "Creation Science." Science--After Its Kind(s). Why God Made Evolutionists. Constructing "The Beginning." Science--Variation in Species. Rhetoric as Usual.